Do you need an orthodontic toothbrush? Is a manual or electric toothbrush better? How do I get behind the wire? Does having braces affect my gum health? What if the wire is poking me in the mouth? What if I have removable retainers? Author: Team Smileworks Smileworks are Liverpool's most popular dental practice. Here’s our very own orthodontist, Dr Laurence Masters with 7 expert tips on how to brush your teeth with braces. Getting braces treatment is the best thing you will ever do if you want a beautiful straight smile. There are a number of options to choose from including removable retainers like Invisalign® or fixed brackets such as Damon Braces or Fastbraces®. 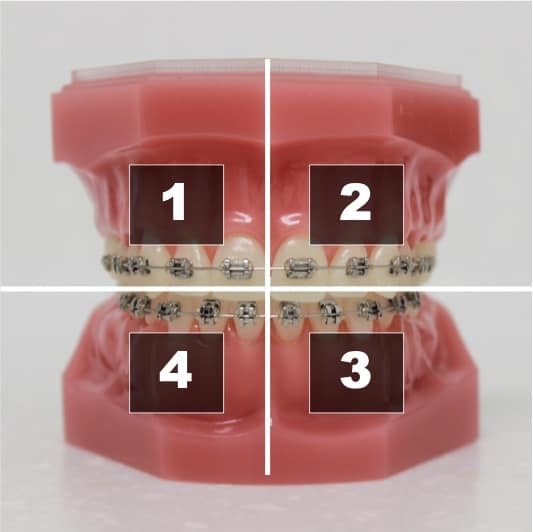 An Orthodontist has an enormous amount of knowledge about different types of braces, wires and brackets and will also be skilled in using removable retainers to straighten teeth. At your consultation you will be assessed and given the best options to straighten your teeth. Any good orthodontist understands the need for an increased level of care while the braces are on the teeth. This is because your teeth are still susceptible to gum disease and cavities while the braces are on and need to be looked after. 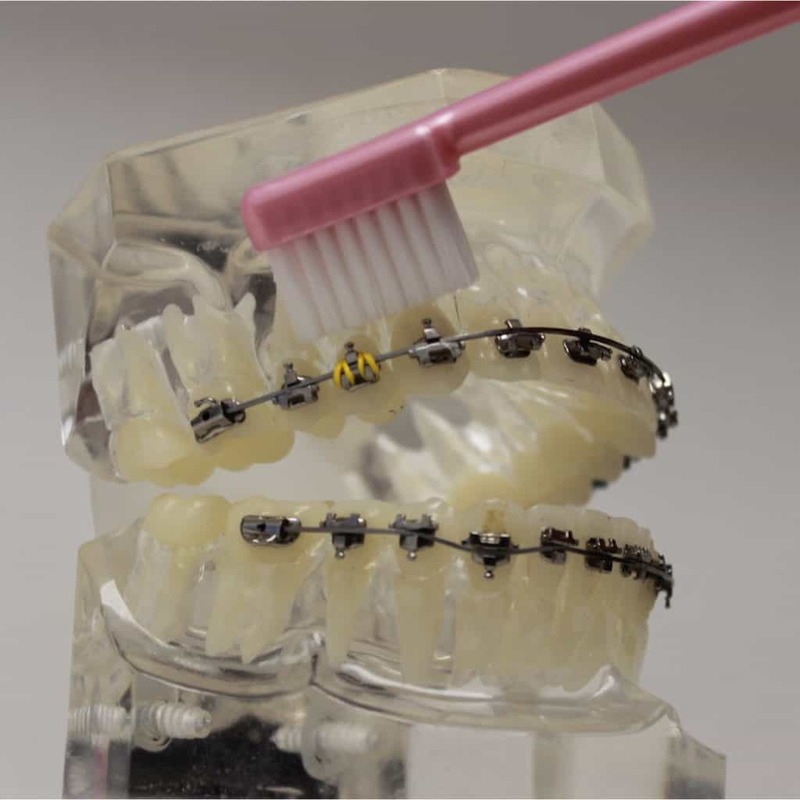 It can be difficult to brush when you are wearing braces and many patients will struggle. This sometimes leads to patients neglecting to brush because they have had bad experiences and haven’t had the process explained properly. So you’ve gone ahead with fixed braces, now how do you clean your teeth effectively so that they stay fresh, healthy and white? Plaque is only soft so you don’t need a really hard brush to remove it from your teeth. Some people brush so hard that they damage their gums and can actually wear the enamel from their teeth. There’s no need for this and you just need to grip the toothbrush lightly and don’t press too hard or brush too vigorously. What’s more important is that you brush in all the gaps and spaces, behind and underneath the brackets and all around every possible part of the mouth. What’s more, if you brush too hard you may knock brackets off your teeth which will mean additional trips to the dentist. To make sure you don’t miss any parts of your mouth while you brush, divide the mouth into four sections, top left, top right, bottom right and bottom left. So going around in a big circle starting at the top left. First place the brush at 45 degrees to the gum and brush the gum above the top wire for 30 seconds. Then move onto the other quarters and repeat. 30 seconds is a long time when you’re brushing and concentrating so perhaps time yourself on your watch or set your phone alarm to beep after each 30 seconds. Some electric toothbrushes will vibrate after the allotted time has passed to help you know when to move onto the next dental quadrant. 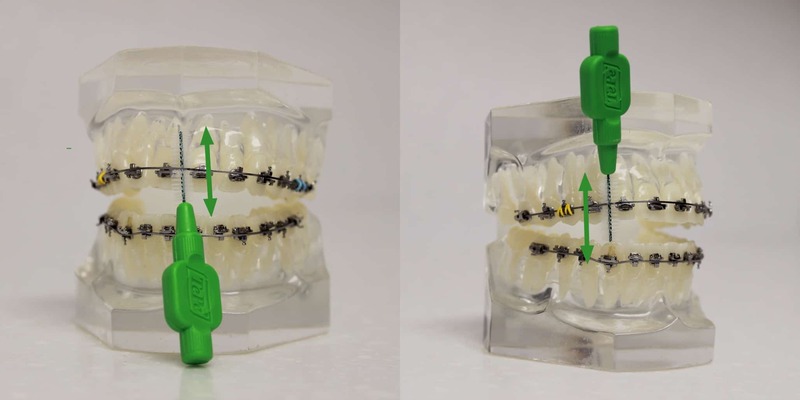 45 degrees is a magical angle where the bristles of the toothbrush will get into and behind the brackets and wires and remove the plaque, trapped food and other debris. This will also mean that you are brushing the gum margin where food and plaque can get trapped and cause problems. Make sure the toothbrush is at 45 degrees to the brackets and gum to remove plaque. Once you’ve brushed the gums, don’t forget to brush the occlusal or biting surfaces of the teeth to avoid cavities. Food can get trapped in tiny fissures and cracks on the occlusal faces of the teeth and brushing it away will prevent bacteria getting into the living parts of the teeth and causing decay. . This will stop you getting cavities by removing the sticky sugar from the tooth surfaces. Then brush as normal below the wire on the top and above it on the bottom quarters. 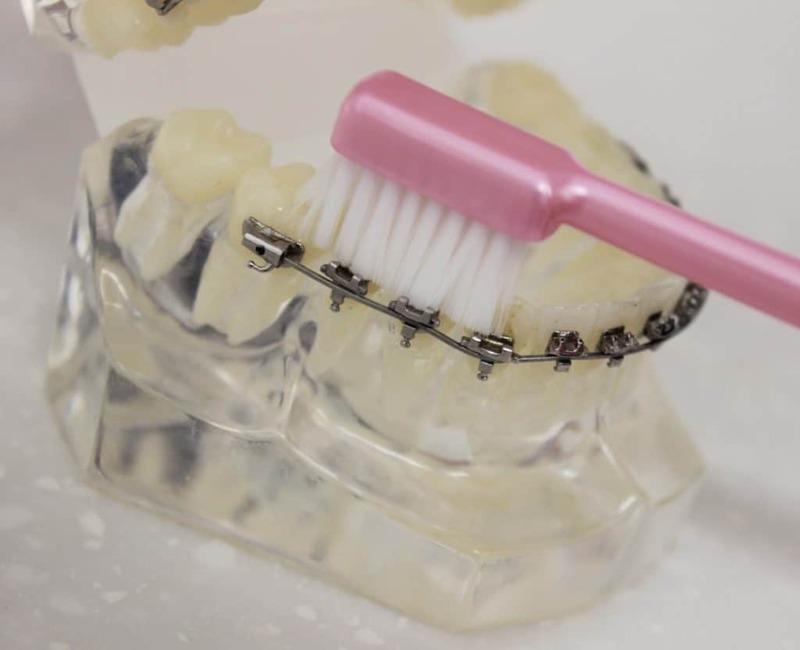 This may take more time than normal brushing but is essential to make sure your gums are healthy and you don’t get cavities while wearing your braces. 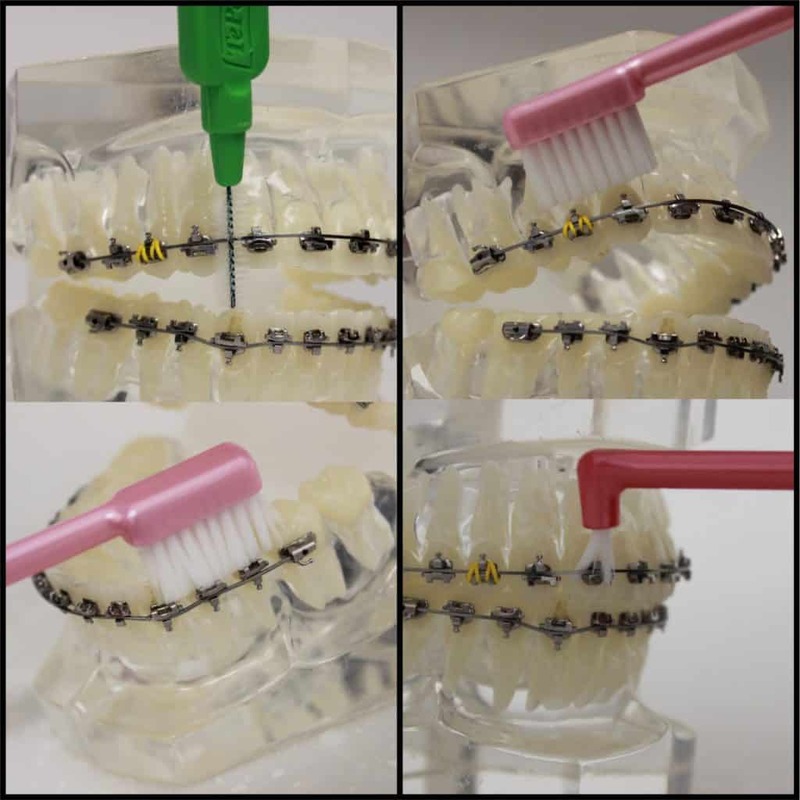 Interdental brushes (Tepe brushes) and also interspace brushes are great for cleaning braces because they can get behind the wires and in between the brackets. Use small (pink, orange, red and blue) Tepe’s as normal between your teeth and also use the larger, yellow, green and purple to get behind the wires and in between the brackets. Tepe brush sizes. Use the smaller ones as normal to get into the interdental spaces and then the larger sizes to get behind brackets and wires – being careful not to knock them off! Be careful not to use brushes that are too big (like the grey and black) as these may cause your brackets to de-bond or ping off! This will not affect your treatment if it’s less than a week until your next appointment. If it’s longer, then make an appointment to see a dentist and have it replaced. So within a week – nothing to worry about – more than a week – give us a call on 0151 236 5166. Flossing is important and if you can get floss between the gaps then you must try this. Don’t worry if wires and brackets are blocking the floss or stopping it. Just move on to the next quadrant and see how you get on. Be very careful not to get floss in between the dental bond and the tooth as you may pull a bracket off. So this must be done with care. Perhaps focus on the veery back teeth which sometimes (depending on what system you are wearing) may not have a bracket on the tooth. Here’s a video by Dr Laurence explaining how to brush your teeth with braces. Learn from the master and follow this advice for the best results. Don’t brush less just because you’ve got to spend longer. Braces are an investment in your smile and in yourself and you should be careful and look after your teeth while the braces are on. Brush twice a day and also don’t forget to use interdental brushes and floss. Make sure you first brush each section for 30 seconds. Don’t brush longer than 30 seconds as plaque is only soft and can be removed with a medium or soft brush or an electric toothbrush. Once you’ve finished brushing with your toothbrush you’ll need to get in between the brackets and in the spaces with inter oral brushes. Remember not to over-do it. Plaque is only soft and can be removed in 30 seconds with good fluoride toothpaste and a soft or medium brush. To learn more about general oral care and listen to our dental hygiene therapists discussing oral health gadgets follow the link here to oral hygiene. See how it gets all over that little bracket! These are great for braces maintenance! 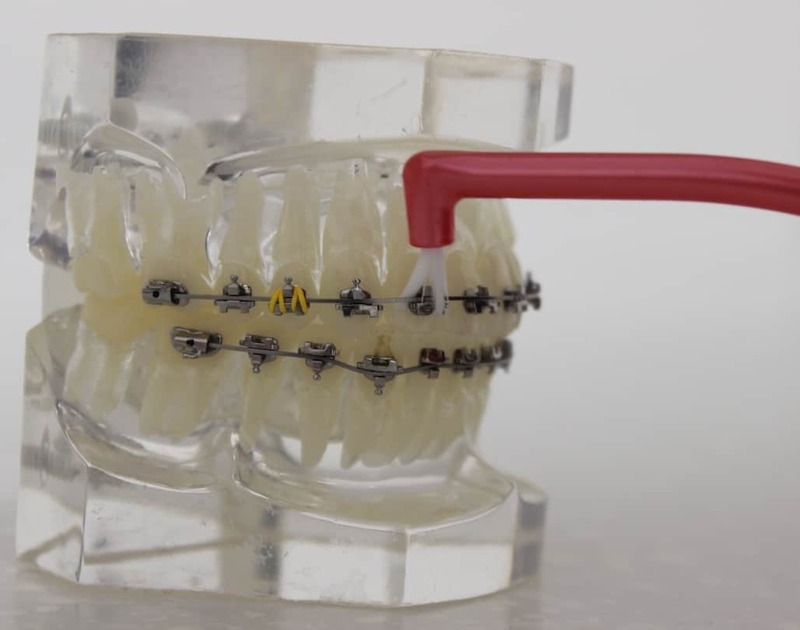 Here at Smileworks you will receive hygiene appointments, all the tools you need to keep your braces clean and instructions on how best to keep your teeth and gums healthy while your braces are on. For more information visit our main braces page here. It’s normal for brackets to come off periodically. Depending on the forces they are applying to the teeth brackets might come off frequently. So long as you tell your dentist they will be able to bond them back onto the teeth at your next appointment and this will not adversely affect the outcome. There is a recent move towards natural products and eco-friendly healthcare. Looking after the environment is great but using a toothpaste without fluoride in it is dumb. The fluoride content of the toothpaste needs to be 1,200ppm to 1,400ppm. It says on the side how much fluoride the toothpaste has in it. Contrary to what most people believe, the water company does not add fluoride to the water supply. Natural water contains fluoride and the water companies manage the amount of fluoride in the water by leaving it alone, removing it or adding it depending on where you live. Public health officials have studies the effect of fluoride in drinking water and keep the levels constant to give you the best hope of not getting cavities and gum-disease. Removing fluoride with filters is probably not the best idea for your teeth! It’s a fact that your teeth are at risk from gum disease and cavities when you are undergoing braces treatment. Because of the difficulties surrounding brushing, it’s fair to say your teeth are more at risk while you have braces on – so this is important. You must come for three monthly hygiene appointments while undergoing braces treatment. Here at Smileworks they come as part of your braces treatment. 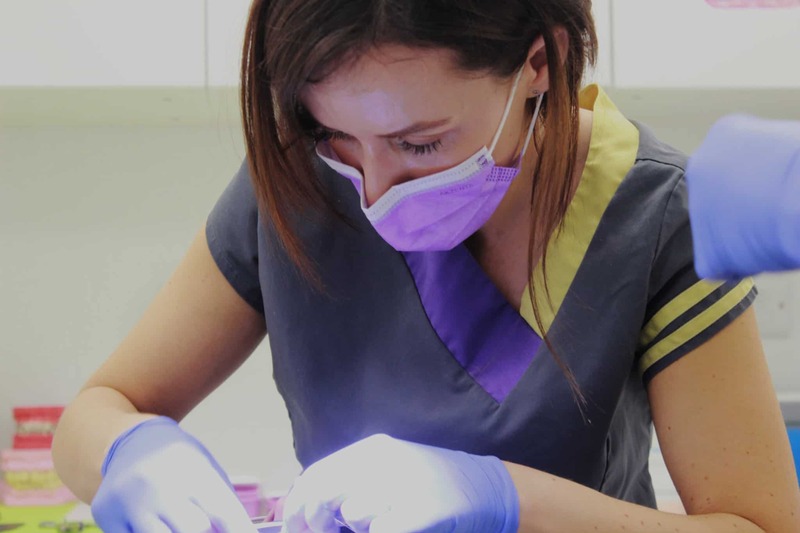 Hygiene appointments with our dental hygiene therapists and hygienists are vital to get in between the brackets and blast bacteria and plaque from under the gum line or areas you simply cannot reach with brushing, flossing and inter oral brushes. Orthodontic toothbrushes claim to be better at cleaning with braces. This is not really proven either way in my opinion. They are certainly not worse than normal toothbrushes but you shouldn’t be losing sleep over not having one. The jury is currently out over this question. It’s been shown that a manual toothbrush is just as effective as an electric one if you use a good technique and spend enough time. Ergo someone with a poor technique would benefit from using an electric toothbrush. Additionally they can time the quadrants which is a pretty helpful addition. The shape of many electric brushes leaves a bit to be desired when trying to get in the spaces between brackets. But many electric toothbrushes have square heads – which might be easier than round. Avoid whitening while wearing your braces. Putting in your whitening trays is usually impossible because they won’t fit over the brackets. But don’t be tempted to try to jump the gun and whiten while the brackets are on. 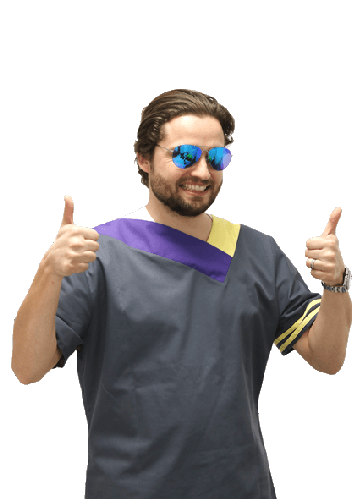 Any self-respecting orthodontist will offer you whitening free of charge in 2018 so you can get down to the business of whitening once the brackets come off. If you have Invisalign® then during the final weeks of treatment you can squeeze some whitening gel into your retainers to get them nice and white. However, Invisalign® retainers are not whitening trays and don’t have reservoirs to keep the gel turning over and close to your teeth. So the result you get from putting whitening gel into Invisalign® trays won’t be the same as if you use Boutique® or Enlighten® custom trays. For more information about whitening follow the link here: teeth whitening. Sometimes you’ll notice white patches that have formed where your brackets were. These are a type of hyper calcification of the tooth enamel and are very easy to remove with a special treatment called Icon. If you’re looking for white patch removal follow the link here to learn more about Icon treatment. It is painful when a patient comes to me with this problem because they will frequently have spent thousands of pounds on braces (Not to mention months and possibly years) and their dentist does not even think to carry out a half an hour Icon treatment to finish the job! Here at Smileworks we’ll always not only whiten but make sure that there are no stains left over from the brackets. Clear brackets are great but they don’t bond as tightly to the teeth as metal or ceramic ones. This can cause problems when brushing, using intra oral brushes or flossing because they might come off. It’s not a huge problem if they come off once or twice but the same bracket continually popping off is possibly going to need a rethink. 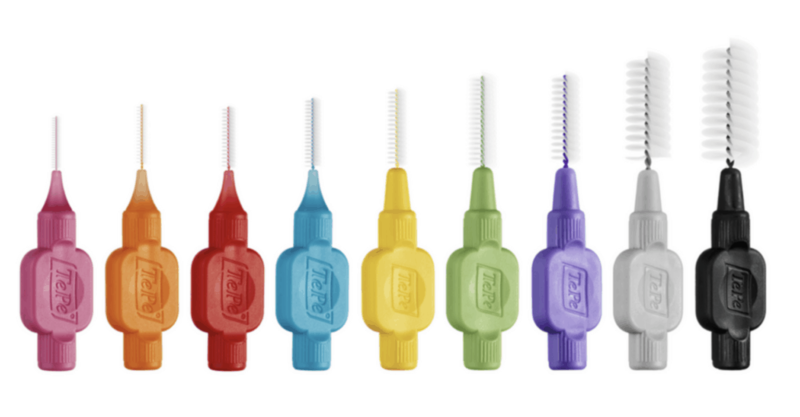 You can get behind the wire with inter oral brushes like Tepe brushes. Choose one of the big sizes like grey or purple and go crazy in those nice big gaps! If you brush, floss and Tepe as normal then no – braces shouldn’t affect your gum health. However, the theory – as often – is a little different and people really struggle with brushing effectively with braces and this leads to increased problems with gum health. 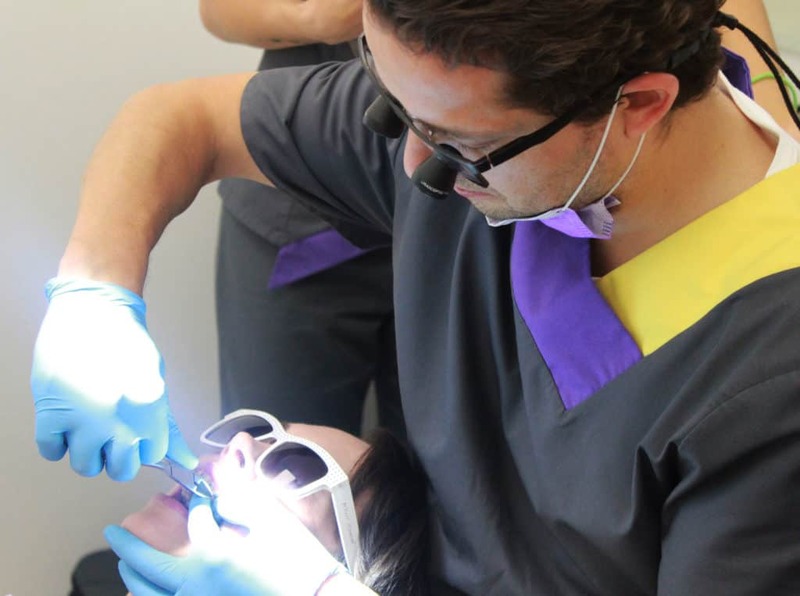 Here at Smileworks we book braces patients in for regular professional cleanings and hygiene appointments and will never put braces on patients with unstable gum disease. If you have removable retainers then just take them out and brush as normal. Then use warm water and a toothbrush to rinse out the trays by brushing them inside and out. Be careful not to brush them with toothpaste as this can damage the plastic. Also don’t use boiling water! The retainers are heat-formed and will turn into a little puddle of plastic if you heat them too much! Wait until the teeth straightening is over before whitening. Your dentist or orthodontist will advise you when is the right time to whiten. For more information on teeth whitening follow the link to out main page.